Last night we flew into Fort Myers Beach, just in time for the lunar eclipse. The skies were clear and we pulled over at a VFW parking lot to take in the whole effect. The red hues were striking and the stars really stood out. In case you missed it, Wired.com has some pretty cool shots of the phenomenon from far-flung places. 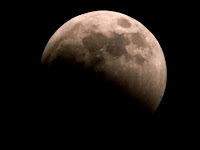 Catch the next total lunar eclipse in 2010!